The Scoop is an ice cream shop. The pocket-sized South Hill neighborhood store is packed on nearly any summer evening with kids, their parents and people who just really like ice cream. But it’s not just an ice cream shop. 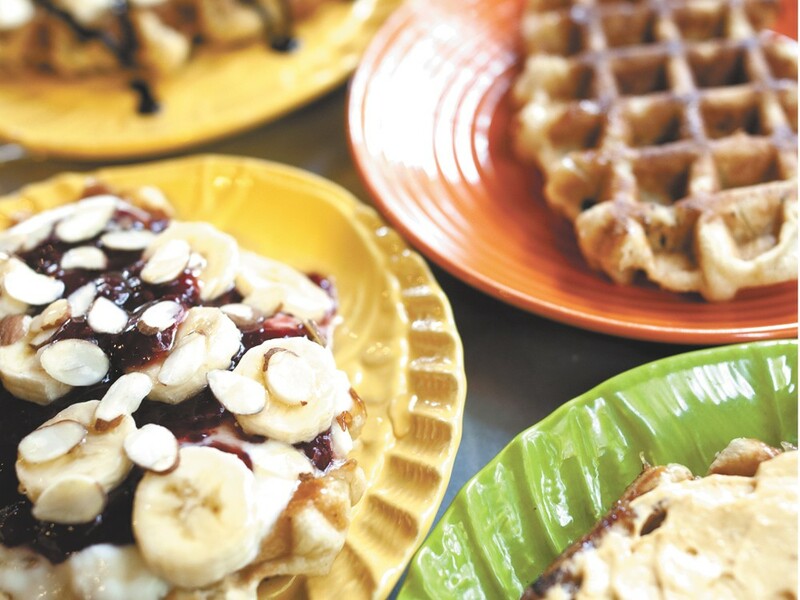 Rather, it’s a place to grab a cold drink, a coffee, a sandwich and not a bad spot to snag a quality breakfast now that The Scoop is serving up delectable (and relatively hard-to-find) liege waffles. The waffles are simple, about the size of your hand and affordable (most are $5). They are also downright delectable — sweet and soft enough that adding even a dab of butter is essentially a waste of your time. That isn’t to say you shouldn’t have something on them. There’s the Yo Waffle, served with Greek yogurt, fresh fruit, honey and nuts. The Baconut waffle is loaded with bacon, cream cheese and nuts while the Affogato is topped with a scoop of ice cream then drizzled with espresso. So yeah, these aren’t Eggos, people. Jennifer Davis, who bought the shop (it opened in 2005) a year ago with her mother, first tasted liege waffles at food trucks in Seattle and Portland before deciding to add them this fall to The Scoop’s menu. Popular in Europe, liege waffles — sweeter, richer and crispier than you’re likely used to — are meant to be a grab-and-go item. Liege waffles might be relatively simple, but bringing them to The Scoop was no easy feat. “The batter is imported from Belgium. I love local, but unfortunately, this isn’t something you can get from the guy down the street. It’s a specialty thing,” says Davis. The Scoop offers an array of fresh baked goods, hot breakfast sandwiches and, of course, coffee, so if waffles aren’t your thing, you’re not out of luck. The Scoop, again, is trying to give a little bit of everything to the people in its neighborhood. “We’re the only place within walking distance, so if we can service the neighborhood with more than ice cream, we’ll do that,” says Davis. Sun., April 28, 11 a.m.-2 p.m.